MIAMI, Fla. /Florida Newswire/ — The new European inspired AC Hotel Miami Aventura by Marriott, which opened last month, is offering introductory specials to welcome new guests. 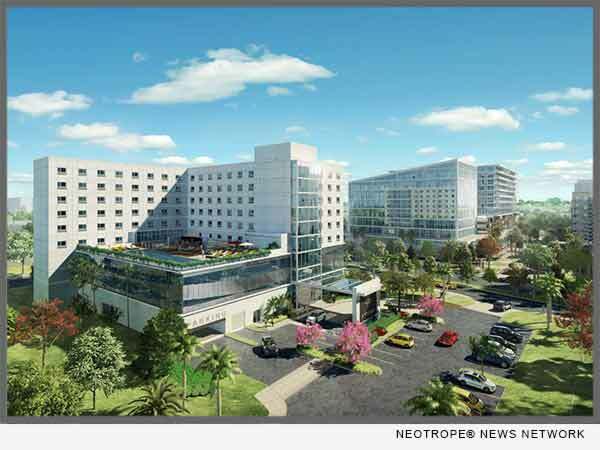 The 233-room property is located at 20805 Biscayne Boulevard, Aventura, steps away from world class shopping and dining options at Aventura Mall, the whirlwind energy of Gulfstream Park Racecourse & Casino and moments away from premier events held at Hard Rock Stadium, South Beach and the Wynwood art scene. Catch the home game action on the field, and make your reservations now with the AC Hotel Miami Aventura Tailgate package, valid from September 1 – December 31, 2017. Both the Miami Dolphins and Miami Hurricanes play at Hard Rock Stadium, a multi-purpose football stadium that offers a premier fan experience after a half billion- dollar renovation last year. The property, managed by Pyramid Hotel Group, offers numerous amenities including spacious and functional guest rooms, rooftop pool, fitness center, meeting space, co-working space, a lively lounge and breakfast. The AC Hotel Miami Aventura, influenced by its European roots provides an energetic vibe punctuated with carefully curated contemporary artwork, grand metal sculptures, dramatic lighting, and whimsical custom chandeliers. The purposeful design carves away what is unnecessary, providing guests with thoughtfully designed moments of beauty; from the sleek, spacious guestrooms that embody design-led efficiencies, to masterfully designed collaborative co-working spaces, with high-tech amenities, a self-service business center and complimentary Wi-Fi. Beverage and food options include the European-style breakfast featuring an assortment of artisan sliced meats and cheeses, tapas, yogurts, house-made breads, cereals, and savory egg tarts. Guests have a choice of home brewed Nespresso, or a variety of flavorful offerings from Starbucks. By evening, the AC Lounge is an inviting hub of social buzz for guests and locals. Expert mixologist creates innovative signature cocktails served with flair, and sharing regional knowledge on imaginative craft beers from local breweries for bar patrons. An inspired bar menu offers culinary light bites from select local ingredients by regional artisans, and delightful Spanish-inspired tapas. Cozy cushions, luxurious lounge chairs, bright poolside umbrellas, and well-appointed bar, along with a large patio area that can be transformed into event space, surround the hotel’s rooftop pool. A well-equipped health and fitness area overlooks the sun-drenched pool deck and features the latest equipment, wall bars, towels, water, televisions and music. AC Hotels by Marriott(r), a lifestyle brand that celebrates a new modern aesthetic complemented by a European soul and Spanish roots boasts nearly 90 design-led hotels in Spain, Italy, Portugal, Denmark, Turkey, France and the United States. Design-driven AC Hotels edit away the unnecessary to remove friction, providing thoughtfully designed moments of beauty, allowing guests to focus on what’s important to them. Property highlights include design-savvy guest rooms with sleek furnishings and intuitive technology features. For more information, visit http://achotels.marriott.com/. Pyramid Hotel Group, is a privately owned full-service hotel and resort company based in Boston. The company delivers superior results to owners by providing outstanding property management, asset management, project management, acquisition services and lender/receiver services. Pyramid manages hotels and resorts throughout the continental United States, Hawaii, the Caribbean, Ireland, and the United Kingdom, delivering outstanding experiences to guests and strong returns to owners at properties ranging from small independent hotels to large branded resorts. Information: http://pyramidhotelgroup.com/.